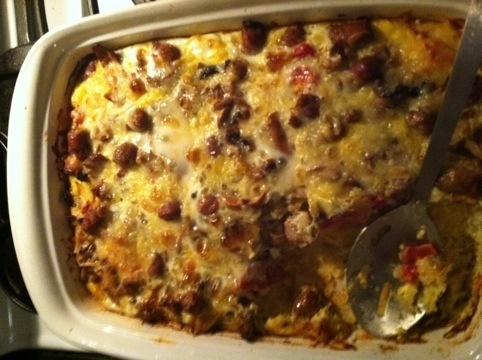 I made this Skillet Ground Beef and Rice tonight and it was fantastic and much loved by my family. A ton of flavor, Gluten Free and healthy. The best part, made entirely from things I keep on hand in the pantry and the freezer. Give it a whirl!! This was our dinner tonight. 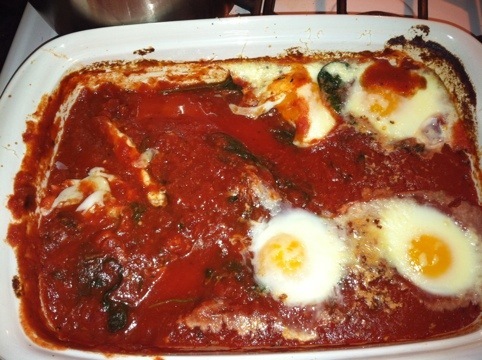 Tomato sauce with spinach poured into a pan followed by some indentations for eggs and some microplaned cheddar. Baked at three fifty for 20 minutes and served over pasta or in a bowl with some lettuce. 5 WW points made with our local eggs and gluten free!! I meant to take a picture right out of the oven but was so hungry I forgot!! Happy Cooking!! Tonight I made a delicious GFree pizza loaded with shredded potatoes, apple chicken sausage, cheddar cheese, tomato sauce and fresh eggs!! I created little topping pockets and cracked the eggs right in. Bake at 500 for 15 minutes and Voila, a little European style pizza magic. In this case I did not par bake the crust so I ended up needing to bake it a scootch to long and thus over cooked the eggs. None the less, it was still delicious and I am still proud. Cannot wait to try this!!! Looks so fancy, delicious and culinary classicish, yet easy to make. Pot Roast Osso Buco Style With Polenta. Total: $27.oo Total Meals Inspired by CSA: 4 so far. Commercially Prepared Pesto: $10 a jar if you want organic. Homemade fresh and delicious pesto: $6.00 (that’s even a high estimate, as I know by the end of the season I will have paid undervalue for the CSA in total.) Homemade pesto will always beat the commercially prepared stuff in a taste test and it truly is one of the best tastes of summer that you can freeze and enjoy all year-long.